Davos 2019 Panel Called "The Debt Time Bomb"
With close to $250 trillion owed to lenders, the world has never been more in debt. How will non-US borrowers and emerging markets defuse their ticking time bombs? Get ahead of one of the issues shaping the global economy in 2019. 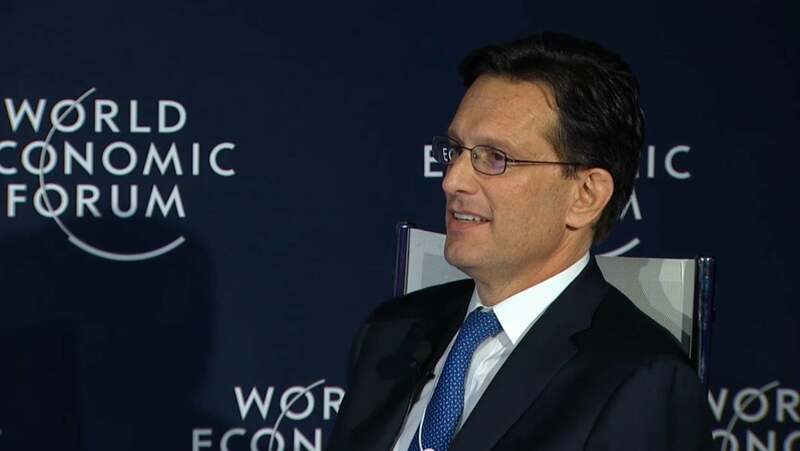 Eric Cantor, Vice-Chairman and Managing Director, Moelis & Company, USA. Jin Keyu, Professor of Economics, London School of Economics and Political Science, United Kingdom; Young Global Leader. Mthuli Ncube, Minister of Finance and Economic Development of Zimbabwe. Maurizio Molinari, Editor-in-Chief, Stampa, Italy. Well I think I suppose that Chairman Powell and those remarks were were he was referring to is the debt of the federal government level and you Recio just spoke about the historic levels of debt and it is something that we've struggled with in the U.S. for now 15 18 years in which we have run a deficit at the federal level. And we also have a debt at the state levels. We have unfunded liabilities in our pension systems at the state level. So there is a lot certainly of debt in the public sector not to mention the private sector in the US. I think one of the things that has been a constant theme though in the U.S. Congress is how do you deal with this demographic challenge that the U.S. is facing together with our health care costs that are continuing on the rise and that's really the essence of the problem at the federal level. And if you look today we'll probably face a deficit of a trillion dollars in the U.S. this year. We are experiencing that largely because every day in the United States 10000 people turn 65 years old. And when you're 65 years old you become eligible for what we call our Medicare system which is our system for seniors health care. Well that that program Medicare happens to be 50 percent underfunded. So every day it's 10000 people times 50 percent underfunded and that's how you so quickly mount this deficit every year. And there's a constant argument in Congress and policymakers how do you fix that and you've seen the Democratic Party come forward with a proposal for even more health care coverage even more liability at the federal level. My party the Republicans have tried to say we need to reallocate the risk and allow patients beneficiaries assume part of that. But that's that's on the government side and we know how to fix it. We just haven't seen the political will mustard to actually address that real problem on the part on the private side. I mean obviously debt has been a big fuel to economic growth in the U.S. And when you couple chairman Paos you know a statement about the low interest rate environment that we have experienced in the U.S. almost since I was a kid I mean we have been a very long time for low interest environments. And so we've got used to that. And any time and I think that what we see and at some point the markets are beginning to view the likelihood of a reversal of that trend in increasing rates as more likely. We don't really know how the American consumer is going to react. I guess we could say if rates go up something like housing which is a big part of our economy that's obviously going to affect the American homeowner when they try to repay their debt and repay their mortgage. And once you have increase interest cost obviously the price of housing ultimately is going to go down because more is going to go towards that interest cause. And the same thing will happen with companies if this trend really does develop. And on the corporate end I mean we've obviously been you know some of the deepest most sophisticated capital markets in the world. But on the corporate end the high yield product in which many companies have undertaken. And if you're highly leveraged what happens is are not really going to benefit from the tax benefits that have occurred. So here come interest rate rises I mean that's a real difficulty and challenge for the private companies that are highly leveraged. So we don't know how all this will play out but we suspect it's going to impact valuations just like in the consumer end it will impact home prices in the private sector. Nonetheless as you know our economy continues to chug along in a very robust fashion. So we'll see a minister him a little bit the third part of this triangle of them edging back it fits. The minister represented the state of Zimbabwe. We appreciate very much being here conceding that the situation on the ground in your home country but secondly starting from the riots and this difficult situation that you're finding in because of the question of the back and speaking more in general for the emerging countries how an emerging country can avoid to be entrapped into that trap. Fifty percent of African countries already in their deaths in an unsustainable debt position already. And this has been happening by almost Stanulis over the last 10 years since June 8. It is being that the effects of quantitative easing was almost two million euros on global debt.